Just a few years ago, Hockley Valley Resort, located in the beautiful rolling hills of Mono, Ontario, opened it’s own winery named Adamo Estate. With gorgeous views and delicious wine, it seemed like a fabulous place for Samantha and Eric to get married! 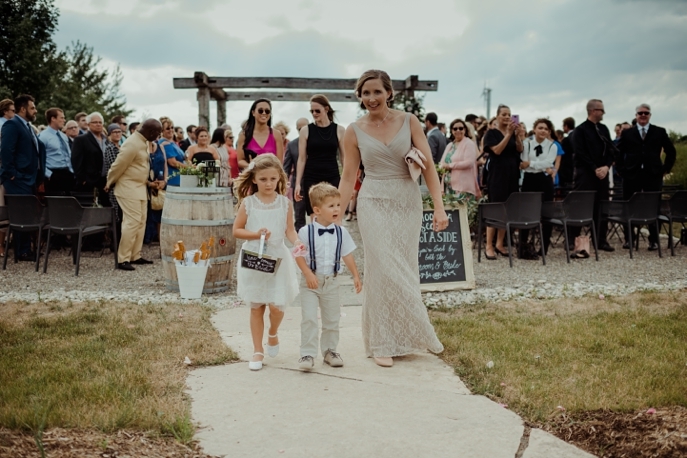 Samantha and Eric had a beautiful (and windy) July wedding at the winery and the photos, shot by my amazing associate photographer and second photographer, turned out amazing!! Check out the bottom of the post for all the vendors involved. **Note that I am NOT getting paid in any way to promote Adamo! I just think its a cool place for a wedding! 2. Your ceremony will have breathtaking views of rolling hills, and a big open sky. 5. You get access to the wine cellar for portraits too! 7. A big open space for dinner with lots of Adamo’s own WINE and big windows for light! So, who is booking their wedding at Adamo now?! 2018 Mini Session Dates and Locations!